I can't think of a better fit for my students, in terms of topic, reading level, and pacing than Gordon Korman's Dive series. 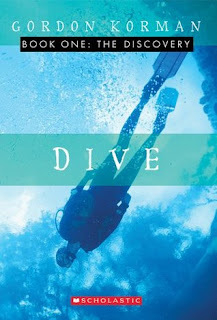 With a class full of developing readers who already have their scuba certifications, this series was an easy sell. True, the first three chapters have quite a bit of exposition. I solved that by recording those chapters so they could follow along with me. Once they got the characters straight, my students buzzed quickly through the series before moving to Korman's other trilogies, Titanic, Island, and Everest. That's twelve books guaranteed to keep my students reading and clamoring for more. When the four interns on a dive expedition realize they were only chosen because they are terrible divers, they discover that there is something nefarious happening. Treasure hunters are searching for sunken gold, and the teenagers refuse to let them get it first! I like that the characters each has a distinct "issue" but it doesn't overshadow the story, nor does it prevent them from becoming friends. The characters have very different backgrounds, but it never comes up as they get to know each other. I wish the same for my students as they meet new people, through diving and otherwise.